Integrate your Kappa Delta Phi letters and colors into your vehicle with our fun selection of Car Merchandise and License Plate Frames. Just about every fraternity member who has driven around for years with a Custom License Plate frame on their car has been blessed to meet other brothers during their travels. It's a welcome mat for fellow members to cross paths. The Metal License Plate Frame for KDP members allows you to enter one line of personalization to appear on the bottom panel. You can enter the full org name, or a saying, like "All For One, One For All." When you drive a vehicle that has a hitch hook up, hide it with a Trailer Hitch Cover from this section. One highlights your Greek letters in an attractive serifed font, while the other displays your fraternal crest and letters in a san-serif font. After you detail your car and make it look like new, add a new set of personalizable Fraternity Car Mats to the floor of the front seats. Countless cars on the road and parked in spaces across the country feature our Car Merchandise and License Plate Frames. 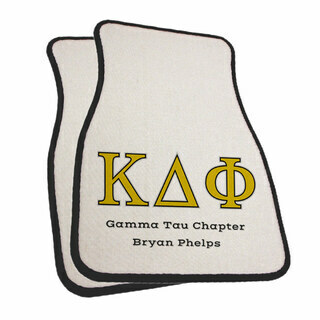 This particular section of our site features Kappa Delta Phi gear for your car. Order today for shipping to your college campus! 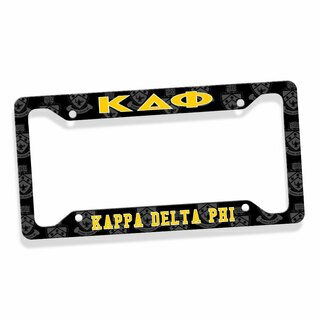 Kappa Delta Phi Car Merchandise & License Plate FramesThe Greatest Selection. Period.